Crenshaw/LAX Line construction: here are some fresh pics. Installation of Glass Canopy at the Hyde Park Station. Installation of plinth rebar for track placement in the southbound tunnel in the underground section of the line. Installation of track in the northbound tunnel. Installation of escalators at the Aviation/Century Station pavilion. Installation of lights on Overhead Catenary System west of Centinela Ave.
Art of Transit: I was remiss in not posting this last month. If you don’t follow us on Instagram, please do so! My colleague Anna Chen does a great job curating the stream and we’re always looking for creative pics that say something about mobility in our area. Tag us if you’ve got a hot pic. 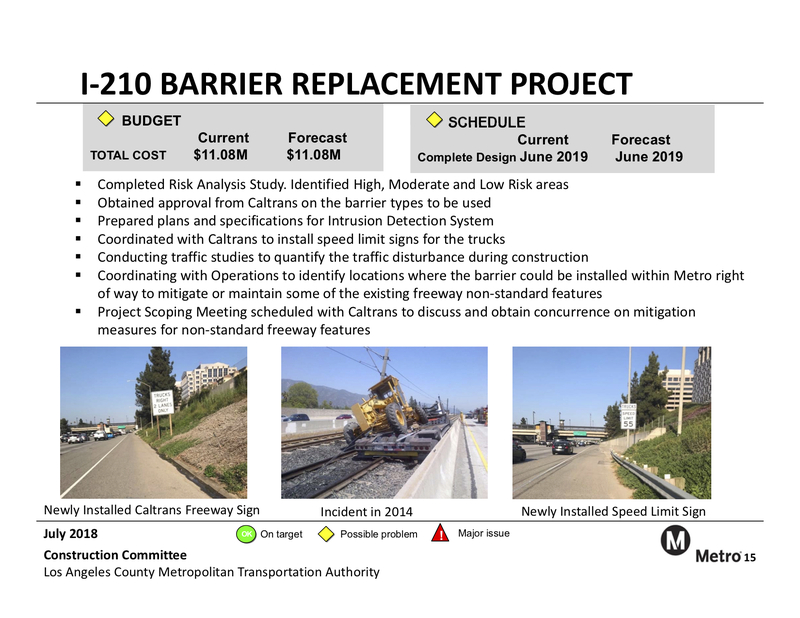 The idea is to prevent trucks and other vehicles from crashing through the barriers and onto the Gold Line tracks, which run down the middle of the 210 from Pasadena to Arcadia. There have been several incidents in recent years that have shut down service (see above). Thankfully none have involved vehicles hitting trains. Much more design and engineering work needs to be done to meet Caltrans requirements. The $11 million above is for that work, which will determine the actual construction cost. You can listen to a brief explanation from Metro staff at the 10-minute mark of the webstream of the Metro Board’s Construction Committee meeting on Thursday. 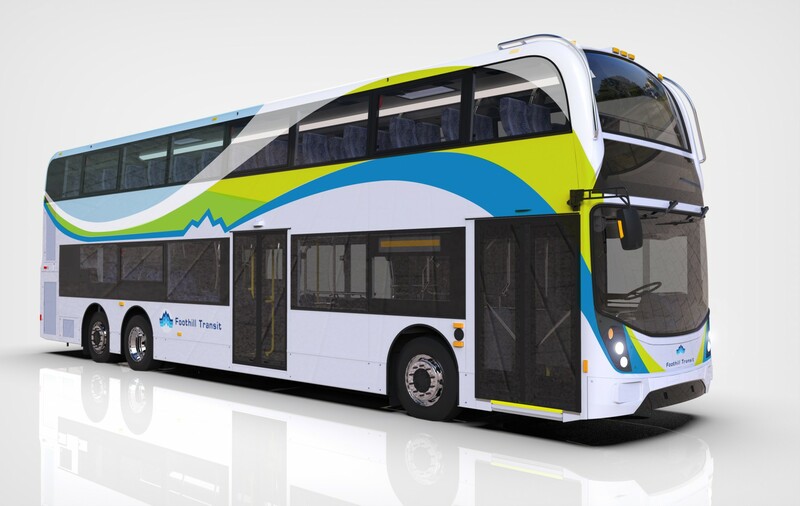 A follow-up to the news that Foothill Transit is going to acquire a couple double deckers. Double deckers have been used in transit service in the past, but the last go-round was with the RTD in the 1980s, which had trouble replacing parts and avoiding low-hanging branches/structures (as reported by the LAT). In LA Mag, Thomas Harlander argues open air double-deckers — like the tourist ones — would be a huge boon to local transit service. “Just imagine what our city would be like if even a fraction of those buses were swapped out for open-top double deckers; not only would the number of decks on a given bus be multiplied by two, but riders on the top would get to bask in that world-famous L.A. sunshine,” he writes. Both Lyft and Uber are increasingly getting into the first/last mile business, hoping to offer “multi-modal” options. This interview with Uber’s CEO offers some insight, with some smart questions — including one about the app possibly getting too cluttered with different options in the future. The big question hovering over all this is whether customers of Lyft’s and Uber’s cheap taxi rides are really looking for multiple options or just want end-to-end rides. In one sense, not exactly new news — the White House has been pushing for more local funding of local projects. The challenge is that local agencies often don’t have enough money to both run transit systems and build expensive capital projects. Metro has somewhat skirted that problem over the years by raising funds locally through four countywide half-cent sales tax measures. Still, some of our projects also need federal dollars — both the Purple Line Extension’s first and second sections and the Regional Connector received large grants. Metro is currently working on finalizing an agreement for the third section of the Purple Line between Century City and the Westwood/VA Hospital. Given the discussion of the Gold Line, does Metro have an official position on the placement of rail stations at or near freeways? Metro and its constituent cities have consistently advocated for increased density near rail stations (as they should), but at the same time the health problems associated with living near a freeway has been well documented. For the Gold Line section above, what’s done is done, but does Metro have a policy to encourage that future rail station placements be a certain distance from a freeway? Open top Double-Decker buses? How robust is Metro’s Liability Policy? As ideals go, double decker busses have to be pretty low on the to do list. 1. Probably can not pass ADA muster. 2. People can not be trusted to go up and down stairs on a moving vehicle. Let alone a stationary one. 3. The open top at any speed will not really be a joyful experience. There are so many things that can be done first. Signal priority on the Orange and Expo and Blue ones would be a productive first one………. The SCRTD color scheme on this bus is vastly superior to the current LA Metro color schemes and should be adopted – especially all the rail lines. As I recall, these buses were used on the 480 Line to Pomona (now Foothill Silver Streak). Yeah. . . NO!!!!! Why on earth would I want those open top tourist buses that operate about as slow as the local buses to be put into transit service? Also, do people just automatically forget that it rains in LA too, like the quick but heavy one we had 2 days ago on the Westside?? Just keep the artics, they do the job where they are needed. The L.A. Mag article treats transit vehicles as an experience rather than a functional tool to get from one place to another. Sorry, but I want my transit bus sheltered from the sun and wind and rain (even here in L.A.). Some cities have managed to sustain a few short routes as tourist attractions using non-economical and uncomfortable vehicles with a “charm” factor (cable cars in San Francisco, historic Routemaster lines in London). But it should be recognized for what it is – not a mass transit option. I’ll take the standard covered, air-conditioned buses, thank you very much. No double deckers. I’m pretty sure that would interfere with any route that crosses our overhead contact wires light rail routes. Especially open tops. It’s all fun and games until someone is stand and would come into contact with those wires. Not sure if my previous comment didn’t make it, but given the reference to the Gold Line’s route along the freeway, does Metro have a policy regarding locating rail stations near freeways? Metro and its constituent cities have advocated (rightfully) for greater density near rail stations, but at the same time it is well documented that there are significant health concerns with living near freeways. For the Gold Line, what’s done is done, but I’m wondering if for any new rail lines built there is a Metro policy that would encourage rail station locations to be located a certain distance from the freeways given the health problems. There is no policy that I know about that explicitly says no freeway lines — and, in fact, part of the Eastside Gold Line Ext would follow the 60 (although not in the middle) and one of the Sepulveda concepts (monorail/rubber tire) would follow the 405. There are, as you correctly suggest, other policies and principals that encourage transit to be built in the most accessible places, i.e. equity platform and transit oriented communities. Honestly the services that could benefit most from double deckers are major lines like the 720 and LADOT’s Commuter Express buses. They could use the ridership boost. Just curious, how will this effect buses running on time as the driver now has to wait for people on the top to get off the bus. They have a hard time keeping on schedule now. Double deckers do absolutely nothing to encourage ridership. Climbing the steps is a hardship. The articulating busses are a better choice to meet demand. Double decker bus would be appropriate if Metro ever got a handle on security issues. When 20% of riders have experienced sexual harassment on Metro transportation because there is nobody monitoring the back of the extended bus or second/third cars of light rail, then having another unsecured section on the second deck of a bus will be just another problem that Metro ignores. While we’re talking about vehicle barriers for the 210, how about considering freeway noise mitigation for the median stations as well? The couple of stations along the freeway are really unpleasant to wait at because of vehicle noise, and also the resulting air currents caused by traffic. I’d like to see some glass or steel fencing barriers that could help with this problem. Double deckers on local service would be a terrible idea. On what Foothill is proposing, which is limited stop park and ride service, it will be fine although they will take longer to board through Downtown, since Foothill policy is to wait until people are seated before pulling away from a stop.